“I discovered something really interesting this year, after all this time,” Wolf Kahn confided, with mock earnestness, when I visited his studio toward the end of last year. “Woods have horizontals as well as verticals.” Even if his deadpan delivery hadn’t alerted me to the possibility of a serious, albeit playful, subtext, one look at the recent landscape paintings ranged along the walls of the studio would have been enough to suggest that Kahn wasn’t being entirely facetious. In this group of bold, surprising pictures – which include some of the largest of his career – the open fields and gentle thickets of the rural world that has long been Kahn’s point of departure have all but vanished. In place of this familiar farm landscape are confrontational expanses of generously scaled, vigorous, multidirectional marks, often white against intense color, that demand to be read as potent equivalents for growth, wild places, and relatively undisciplined nature. It’s as if working large – some recent canvases are about eight feet wide – has permitted or perhaps forced Kahn to expand, both metaphorically and literally, his physical means and his pictorial vocabulary. Not only has there been a shift in the character of his imagery, but the size of areas of color have also increased or their number multiplied, while Kahn’s gestures have become larger, more assertive, more independent, and more free-wheeling in their orientation than we’ve been used to in his work of the last years. These marks are still intensely evocative of observed experience, but they also declare themselves as powerful reminders of the presence of the artist not simply as observer, but as a willful, assertive maker. In some pictures, this energetic drawing accumulates into a dense tangle, barring our entry into barely-hinted-at depths, while in others, wristy, staccato sweeps and stabs act as a casual horizontal lacing, haphazardly binding together the other elements in the picture. The greatest degree of incident is often pushed to the periphery of the canvas, canceling out any lingering associations with centralized recession of traditionally depicted landscape space and announcing, once again, the insistent presence of the artist as inventor. Space opens and closes in these pictures, as a result of the varying densities of drawing. Some pictures are like optical entry; others are more accommodating, offering relatively open passages that allow us to imagine that we can move into the fluctuating, fictive interior of Kahn’s illusory terrain. The recent pictures are recognizably “Kahns,” with their radiant hues, tangy contrasts of color, and pervasive sense of intense light, but there’s something notably free and improvisatory about them. In many ways, their emphasis on touch recalls some of the first works with which Kahn announced his presence as a painter to be taken seriously, in the 1960’s. In these formative works, exuberant, rhythmic marks that bore witness to the young artist’s descent from the tradition of Abstract Expressionism were put into the service of landscape references that attested to his independence of mind. In his recent “gestural” pictures, however, Kahn’s handwriting is more fluent and delicate, and there’s a new transparency, even in the densest of his new landscapes, a slow pulse between clarity and blur. “I tend to gravitate between pictures in which very little is going on and pictures that have a lot of stuff,” Kahn explains. Yet in the recent, “tangled” landscapes, it’s difficult to decide which are which. Are the ones with “a lot of stuff” the pictures that suggest densely wooded hillsides, in which interlaced branches and slim trunks form aggressively frontal expanses? These implacable roadblocks of gesture are full of complex incidents of broken color and knotted drawing that can be as engaging – or perhaps even more engaging – than the picture’s evocation of anything in the natural world. Or are these deceptively simple, all-over fields of repeated gestures the paintings in which “very little is going on?” How do we classify the cooler, more classically ordered images, with their rows of narrow trees? They are like the attenuated colonnades of impossible delicate temples, barely screening luminous, indeterminate backgrounds, with the whole loosely stitched together by rhythmic horizontal strokes. They seem uncomplicated, at first viewing, yet some of the pictures of this type prove to be among the most spatially complex of Kahn’s recent work, with chromatic and tonal shifts across the width of the canvas that create subtle suggestions of projection and depth, at the same time that they remain declaratively about paint and line on a surface. Even the calmest and most apparently lucid of Kahn’s intricately constructed recent pictures exists in terms of an accumulation of nervous, repetitive gestures, while even the most uncompromising, snarled, densely layered composition resolves itself, at intervals, into moments of clarity. 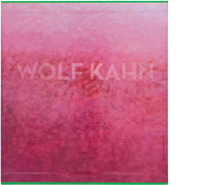 Like all of Kahn’s most achieved works, whatever their scale and whatever their medium – intimate pastels have always been an important part of the artist’s oeuvre – his new large canvases explore a shifting territory located somewhere between the familiar and the imagined, between the specific and the dream-like, even between the scrupulously observed and the abstract. Part of the fascination of Kahn’s strongest pictures, a category to which his new large landscapes must be assigned, is this very doubleness. No matter how simplified, his imagery is elemental and usually easy to grasp; houses and barns are presented as unequivocally legible profiles, while the fundamental relationships of landscape space – the way, for example, the ground plane supports masses of vegetations and trees – almost always seem rational. We can always readily understand Kahn’s images in terms of our experience of the real world. That, and the sheer gorgeousness of his color, are no small part of their appeal. What distinguishes his most compelling works is that there is nothing literal in the ways in which he suggests his motifs. Quite the contrary. We are given enough visual clues – telling shapes and proportions for example – that we have no difficulty recognizing the crowded, slender trunks of the second-growth forests of the Northeast, or the clear planar structure of New England farmhouses and barns, or, on occasion, the sturdy geometry of Italian walls and fields, or the particulars of more exotic places, but when we spend more time with these works, we are forced to acknowledge that we interpret Kahn’s multivalent allusions from suggestions that, far from being explicitly descriptive, are economical to the extreme. Sometimes that economy itself invites justification by offering its own associations; a farmhouse reduced to a familiar silhouette or a grove of trees turned into a row of parallel verticals can ask to be read as, say, being veiled in mist, as blurred by the low light of dawn or dusk, or as lost in the dazzle of midday. But in some of the most mysterious of Kahn’s pictures, we can feel that we receive only intimations of his nominal subject, rather than being given an opportunity to study it. It’s as if the unreliability of perception itself or the passage of time were as much the theme of the painting as the motif that presumably generated it. In his recent large landscapes, this is intensified by their confrontational structure; we feel as if we were seeing through a wealth of unstable pictorial incidents, rather than, as in traditional landscapes, seeing into the picture and encountering a comprehensible, illusionistic, stable world. Kahn’s universe is, for the most part, an orderly one, so it’s particularly noteworthy that, despite their obvious underlying sense of the rational and despite their being no less lushly beautiful that the works that preceded them, his recent, declarative, large landscapes, with their full-bore color and urgent, scribbled lines and strokes, also carry overtones of unease and disquiet. Kahn sees this as inevitable, given the state of the world in which he finds himself today. “The nervousness of the moment is reflected in the work,” he says. Yet even when the relentless rhythms of the marks and the esaggerated, slightly acidic harmonies of color hint subtly at anxiety, the place Kahn ultimately invokes is a zone of harmony, stillness, and radiant light – a domesticated New England version of Arcadia. Despite the luxurious, super-heated, “tropical” color he routinely deploys, Kahn’s settings usually seem to be not only Northern, but recognizably American: Charles Baudelaire’s Mediterranean “luxe, calme, et volupté” transposed into the more austere pastoral language of Robert Frost’s Vermont. But in the end, no matter how convincing these images are, no matter how much they remind us of familiar or even idealized places, painterly values always trump allusion and associations. The more time we spend with Kahn’s pictures, whether they are works on canvas or paper, the more we are made aware that he conjures up all of his comforting associations not by depiction, whether accurate or approximate, but by essentially abstract means. Far more than they are images of the known, Kahn’s pictures are non-specific constructions of wholly artificial, albeit evocative color. That’s when we remember that, as a very young painter, Kahn was a strudent of two of the most inventive and uncompromising modernists of the New York School, Stuart Davis, with whom he studied briefly and who apparently didn’t impress him much, and Hans Hofmann, with whom he had a much longer and closer relationship and whose influence was long-lasting. Kahn is fond of telling slightly disreputable anecdotes about Davis’s lack of interest in his students, but it’s possible that some of Davis’s deep understanding of both Cubist structure and the role of color in creating space may have found its way into his teaching. It’s interesting to remember, too, given the mature of Kahn’s signature fusion of abstract principles and clear allusion, that Davis always insisted that he wasn’t an abstract painter, but rather one who based all his work on his perceptions of actuality, which for him embraced both modern urban life and improbably, the working harbor of the Cape Ann fishing port, Gloucester, Massachusetts. Yet there’s no arguing that Hofmann’s teaching – and the example of his work – were of far greater significance in the eventual evolution of Kahn’s art. The legendary teacher’s practice was firmly based on ideas about the role of color and shape as the building-blocks of space and on the equally firm conviction that the tangible, visible dramas enacted by masses of intense hues on a surface were manifestations of larger ideas about the universal. Whether Hofmann’s near-mystical sense of the relation of man and nature, embodied as absolutes in the language of paint, has anything to do with Kahn’s devotion to landscape themes is open to debate, but there is no question that his formal principles had, as they did for so many of the émigré German master’s students, a lasting effect. As he learned long ago from Hofmann, Kahn still bases his pictures on the way masses of saturated hues can be made to “push and pull” each other into fictive space, although somewhere in the intervening decades, he also seems to have become as interested in the implications of Pierre Bonnard’s unstable, interwoven color structures, and intimate glimpses of familiar places as in Hofmann’s elemental oppositions. Kahn turns eighty in 2007, which makes his recent work officially eligible to be termed “late style.” “Late style” is what is supposed to happen to gifted, long-lived artists. At best, it manifests itself as a bold expansion of ideas implicit in earlier work or as a reckless exploration of new possibilities. The most exciting late style works seem fearless, as if the maker’s accumulated experience of thinking about, looking at, and making art over a long working life is so powerful that it obliterates all preconceptions of what a work of art could or should be. What links most late style work is the sense that its authors knew so much and had done so much that they were unwilling to deny themselves anything or to please anyone but themselves. This manifests itself in the energy, the generosity of scale, and the spontaneity of Kahn’s recent works, and in the way he uses color to punctuate and syncopate his calligraphic expanses. “I have an axiom,” Kahn says, “that unless a picture has ten times the content that you intended, you’re not an artist.” I won’t attempt to quantify the qualities of his recent large landscapes or to speculate publicly on their presumed meaning, but it’s obvious that they offer us a great deal, both in terms of visual pleasure and provocative associations. It that’s ten times what Kahn intended, so much the better. In any event, these recent works are among his most surprising and satisfying to date – true embodiments of late style – for which we are all grateful.